One of the brightest spots for Republicans in the 2014 midterm cycle thus far has been the unexpected competitiveness of the Michigan Governor's and Senate race. Not so long ago, incumbent Republican Governor Rick Snyder's job approval ratings were in the doldrums, as Democrat Gary Peters enjoyed a near-year long polling advantage over Republican Terry Land in the battle for retiring legend Carl Levin's senate seat. To boot, Barack Obama had just won Michigan, Romney's home-state, by ten points, while incumbent Democratic Senator Debbie Stabenow went on to topple her Republican challenger by 20 points. In other words, things just didn't look as feasible for Republicans as they do today in Michigan before the last few months. 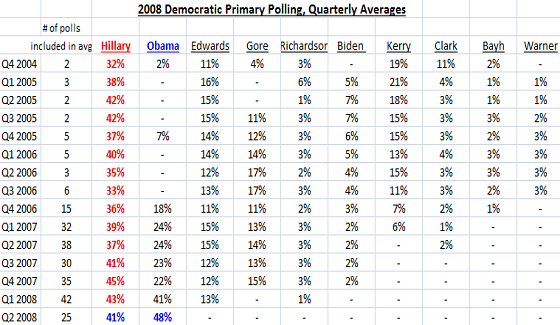 Only the last 3 Michigan Sen/Gov surveys with readily available crosstabs were used in this comparison. 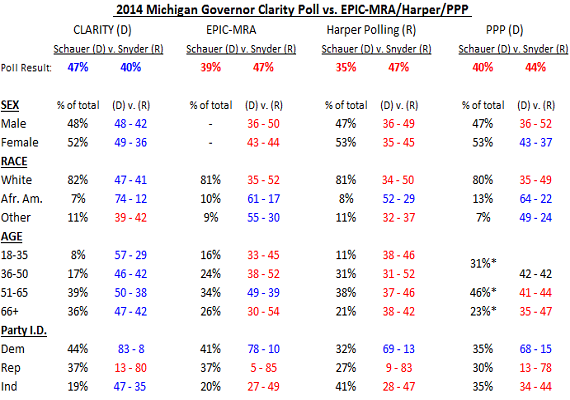 As you can see, with regards to the 2014 Michigan Governor's race, it's as if Clarity and Epic/Harper/PPP are polling in two different universes. Of the twelve measurements considered across four demographic groups, Democratic challenger Mark Schauer leads Gov. Rick Snyder in all but two. The opposite is true for Epic-MRA, Harper Polling, and PPP. 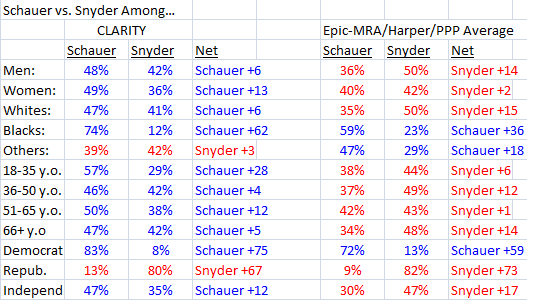 Epic-MRA finds Rick Snyder leading Mark Schauer in EIGHT of the TWELVE measurements examined. Harper finds him leading in TEN of TWELVE measurements, PPP finds Snyder leading in six of eleven measurements. Cassidy and Landrieu are locked in a tight battle, though it's Phil Robertson who appears to be the strongest candidate to take on the Democratic incumbent, at least according to PPP. His lead grows to nearly double digits if PPP had found racial and partisan identification along the same lines as 2010, and not 2008. Three-term Louisiana Senator Mary Landrieu (D) is no stranger to tough races. In 1995, before being elected to the Senate, she finished third in her state's jungle primary for the governorship, shutting her out of the eventual run-off election. The next year, her attempt to leap into federal office nearly failed, when she defeated former Democrat-turned-Republican Woody Jenkins for the U.S. Senate seat by an exceedingly narrow 50.2 - 49.8% margin (under controversial circumstances), making it the most competitive of thirty-three Senate races held nation-wide that day. For reelection in 2002, she narrowly escaped defeat by a 51.7 - 48.3% margin, even as Republicans, bolstered by intense focus on foreign policy in the wake of the September 11th attacks, racked up wins across the country. Only three Senate races were more competitive that cycle. Barack Obama's election in 2008 brought with it a Democratic wave that saw their numbers swell in the Senate by eight, and by 21 in the House. Needless to say, it was Landrieu's best performance for her seat to date. She won by a reasonably decisive, though far from overwhelming 52.1 - 45.7%, making it the sixth most competitive Senate battle of the cycle. But what's more? 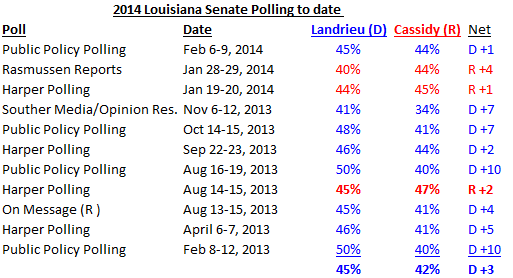 Three of the five pollsters to dive into the field in Louisiana have found an interesting trend. At least in terms of racial/ethnic and partisan identification, PPP, Rasmussen, and Harper are finding an electorate more akin to the 2008 presidential election, when Landrieu won by her most impressive margin to date, than in 2010, when David Vitter (R) easily dispensed of his Democratic opponent by 20 points. Unfortunately, there were no exit polls in Louisiana in 2012. But in 2008, as the historical candidacy of Barack Obama brought out a particularly racially diverse electorate nationwide, nearly 1/3 (29%) of Louisiana's electorate identified as African American, virtually identical to recent PPP (28%), Rasmussen (29%), and Harper Polling (29%) findings. White voters made up 65% of the 2008 electorate, again, nearly the same as found by PPP (66%), Rasmussen (66%), and Harper Polling (64%). Former Gov. Mario Cuomo (left) was mentioned as a possible presidential contender on three different occasions, and was a polling frontrunner in two of them, even polling well ahead of eventual President Bill Clinton at one point. He famously never took the plunge. Photo courtesy of AP/Stephan Savoia. The sixth and final part to this series exploring very early primary polling in 15 different contested presidential primaries since 1976 will examine the six contests in which the eventual nominee did not make a splash in national polling until much later in the primary process than those discussed in parts 1-5 (found here, here, here, here, and here). In other words, we'll be looking at Barack Obama's nomination in 2008, John Kerry's in 2004, Bill Clinton's in 1992, Michael Dukakis's in 1988, Jimmy Carter's in 1976, and Gerald Ford's in 1976. This group of six men never enjoyed the early and persistent polling success of Al Gore in 2000, George H.W. Bush in 1988, and Bob Dole in 1996. Far from Romney in 2012, McCain in 2008, Bush in 2000, Mondale in 1984, Reagan in 1980, and Carter in 1980, they were barely blips on the radar of most early national polling. These are the 6 presidential primary contests where a poll-watcher would have been the most wrong had they relied on those early poll numbers released in the weeks and months following the presidential election. And we'll start with the man who currently occupies the office, President Barack Obama. For anyone who wasn't paying attention to election polling prior to Obama's 2008 nomination, they might be surprised to learn that the twice-elected, first Democrat to win a national majority since Jimmy Carter didn't even show up in regular Democratic Presidential primary polling until the fall of 2006. 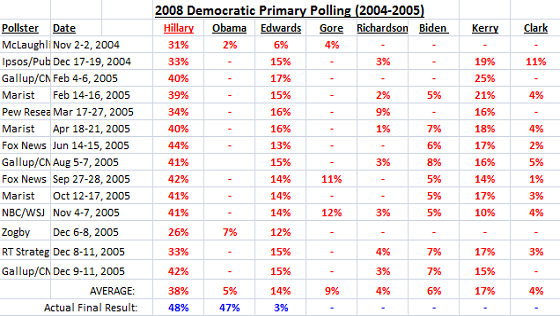 In the fourteen surveys conducted in the first year of primary polling following the 2004 election, Obama's name was only included twice. For comparison's sake, Hillary Clinton and John Edwards were included in all fourteen. With the exception of a single, outlier Gallup poll in the summer of 2007, Obama never led Hillary Clinton in a multi-candidate or one-one-one survey of Democratic primary voters until February 2008, after the Iowa, New Hampshire, Nevada, Michigan, Florida, and South Carolina primaries had already been held. And even then, he relinquished his national lead back to her on a handful of occasions following her Texas/Ohio and Pennsylvania primary wins. For that matter, when considering ALL votes cast, Hillary likely won the popular vote, despite losing the delegate count. If you think that what happened with Obama in 2008 can't happen again, then look no further than his Democratic presidential predecessor, Bill Clinton. In 1992, many commentators lamented the abnormally slow pace with which Democratic presidential candidates were entering the 1992 race. And the public seemed unusually disinterested for such a relatively late stage of the game, thanks in large part to a still war-strong President Bush. Obviously, it seems this would be the primary reason that so few national Democratic primary polls were conducted during the 1992 primary process, as you'll see in the table below. Regardless, eventual Democratic nominee Bill Clinton didn't appear in a single national survey until the Summer of 1991, two-and-a-half years after Bush's inauguration, and just five months before the start of primary contests. Not surprisingly, the frontrunner was Senator Ted Kennedy, the early polling favorite for the 1972, 1976, 1980, 1984, 1988, and now 1992 Democratic nomination. It's worth noting, however, that this was the last Presidential cycle in which Senator Ted Kennedy started out as the early favorite, and was likely the last time he led in any Democratic primary poll ever again. Ronald Reagan and Gerald Ford were interparty rivals for two consecutive primary cycles. Ford won their first encounter. The two were essentially tied in early 1980 GOP primary polling, until Ford announced he would not run for President a second time. Photograph by David Kennerly. My original intent was to post this multi-part series all in sequence. But as it often does, life, work, and general procrastination took over. Oh well, better late than never. Here is the completed string of posts, in two final parts, on the extent to which very early primary polling has foretold final primary results, looking only at the fifteen contested presidential primaries dating back to 1976. The data leaves room for one conclusion - the clear polling "frontrunner" in the first and/or second years following the preceding presidential election is seldom the eventual nominee. So seldom that it has only occurred three times since 1976, as discussed in Part I of this series. The remaining twelve contested presidential primaries can be split evenly into two groups: (1) those where the eventual nominee appeared in early surveys, but not as the clear frontrunner (as discussed in Parts II through IV, and this post in particular), and (2) those where the eventual nominee seems to have come from nowhere, emerging in much later polling, sometimes after primary contests have begun (which is coming up in part VI). Joining the 2000 and 2008 Republican and 1980 and 1984 Democratic primaries, the 1980 and 2012 Republican primaries wrap up this discussion of contests falling into group one discussed above. It may be surprising to learn that Ronald Reagan, who won both of his general election contests handily, and carried 60% of the primary vote in what was originally a crowded 1980 field, was NOT the clear frontrunner in 1977 and 1978, years before any contest was ever held. And the same can be said for Mitt Romney in 2012 - despite a decisive overall victory, his polling advantage was no where near as substantial in 2009. Consider the two tables below. As you can see in the 1st table, Gerald Ford, who became an unexpected thorn in Reagan's second quest for the Presidency in 1976, was back and causing trouble again for his third. The unelected former President's close loss to Jimmy Carter led many to speculate Ford might run again, and he did little to squelch the speculation. 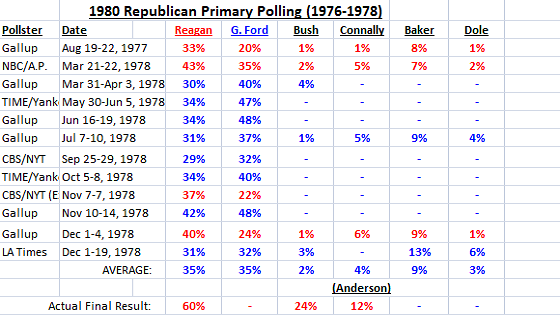 As far as pollsters were concerned in the first year or so following Carter's victory, Ford's odds of winning the Republican nomination for a second time were as good as Reagan's. Across twelve surveys taken in 1977-1978, the two traded polling leads and averaged 35% of the Republican electorate apiece. Meanwhile, 1980 runners-up George H.W. Bush and John Anderson barely registered in early primary polls. Mitt Romney, like Reagan before him, had also run for the Presidency before, and also had an old nemesis holding him back from "clear frontrunner" status in those first months of primary polling following Obama's historic win. Mike Huckabee had surged from no where in 2008 to win the Iowa Caucus, and was polling either in 1st or 2nd place in every '12 GOP primary survey taken in 2009. Romney was also locked in a three-way battle for early polling supremacy with the most recent Vice Presidential nominee, Sarah Palin. In fact, it was Palin who had the highest polling average among likely Republican primary voters in 2009, buoyed largely by a Rasmussen survey taken the day after the 2008 election showing her with the support of nearly 2/3 of likely 2012 primary voters. Though he was rarely tested in 2009, the few times he was, Rudy Guiliani posted formidable numbers, even leading the field in one Fox News poll. PPP finds that Palin's support among Conservatives, Republicans, and 2012 Romney voters is less unified than Begich's support among Liberals, Democrats, and 2012 Obama voters. Yet Palin, who resigned from Alaska statewide office almost five years ago, only trails 44-40% in a new poll. Pic courtesy of Joshua Lott/Getty Images North America. One of the country's most unpopular politicians, at least according to national favorability surveys, is competitive nonetheless in the state she governed for almost three years from 2006-2009. The latest poll from Republican agitator and Democratic pollster, Public Policy Polling, finds Senator Mark Begich's standing with Alaska voters deteriorating significantly over the last year, with what was once a near 20 point lead over former Governor Sarah Palin in a hypothetical Senate match-up deteriorating to just a 4 point lead, barely outside the poll's 3.6% margin of error. And a close look at the numbers indicates she's closer to her polling floor, while Begich is closer to his ceiling. For the record, Palin isn't even all that popular in Alaska, much less the brutal numbers she receives nationwide. A year-old Harper Polling (R) survey found Palin with an abysmal 34/60% favorability rating in The Last Frontier, while PPP puts her currently at 39/55%. But at least as far as the Democratic pollster is concerned, Palin's standing has gradually improved since their first survey in February of last year (from 34/59% favorability to 39/55%), reaffirming that absence can make the heart grow fonder. In fact, -15% represents her best favorability rating in PPP polling of the state of Alaska since 2010. Furthermore, PPP's 44-40% Begich vs. Palin finding is the best she's performed against the incumbent in any survey taken of the race to date. And if you dig into some of PPP's crosstabs, you can begin to see how Palin has more room for growth. Namely, Democrats, Liberals, and 2012 Obama voters are very united behind Senator Begich. 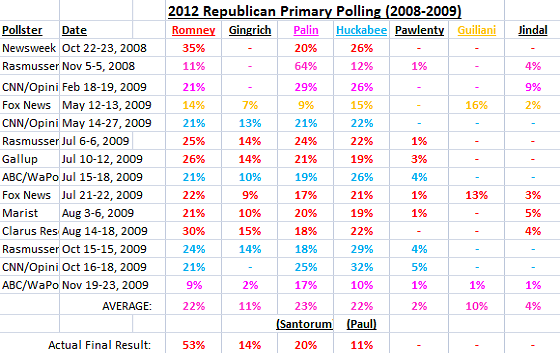 Republicans, Conservatives, and 2012 Romney voters, on the other hand, are less united behind a Palin Senate candidacy. For starters, take 2012 Obama voters. Those respondents supported Begich at a rate of 88%, while only 69% of self-identified Romney voters supported Palin. Among the 12% of Alaskans who said they voted for someone other than Romney or Obama in 2012, or didn't know either way, Palin led 36-30%. Consider also PPP's partisan identification findings. Eighty-two percent of self-identified Democratic respondents said they would support Begich this November, while just 68% of Republicans said the same of Palin. Independent voters supported the Democrat by 16 points. Finally, look in the crosstabs for the ideological findings. Palin carries roughly 1/3 of Conservatives (64%), while Begich nabs over three-quarters of Liberals (77%). He also wins moderates by a huge margin (64-26%).